1 Club Med All Inclusive Resort. WEsay If you are looking for a great small ski area with alpine charm this is a good choice. Valmorel is situated in the heart of the famous Tarentaise region and comprises separate 'hameaux' or hamlets, each with immediate access to the 151kms of slopes and doorstep skiing. 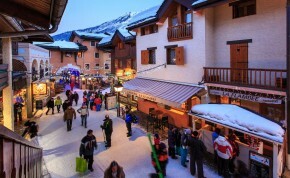 Traditionally Savoyarde in style, the village is made up of pretty wood-clad buildings and features an attractive cobbled pedestrian plaza, packed with interesting bars, shops and restaurants, creating a true Alpine village atmosphere. The resort is very family friendly: it is traffic free and there are great kids’ facilities. Valmorel shares the ‘Grand Domaine’ lift pass with Doucy Combelouviere and St Francois-Longchamps. Heavy investment in snowmaking means most home runs are covered throughout the season, despite the slightly low altitude. Unsurprisingly the resort is great for beginners, with plenty of roped off nursery slopes for young and old alike. There are also some long blues from the top of the two main village lifts – the Pierrafort Gondola and the Altispace chair. The latter of these also links to a further network of pistes and lifts. The toughest skiing is on the North-facing slopes of the Col du Mottet and neighbouring Col du Gollet. There is also a terrain park under the Creve-Coeur chairlift, with a boardercross course and half pipe. Other snow-based activities include snowshoeing, airboarding (tobogganing on an inflatable raft), snow scooters and quad biking. 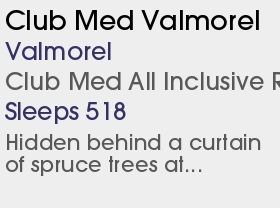 More calm pastimes can be found at the Valmoforme Centre, where there are saunas, hammam, massage and hydro massage. The nightlife is fun-loving and friendly. There are ideas to change both the Mottet and Biollene chair lifts, but a public enquiry means they will not be constructed for the coming winter. Snowmaking is being enhanced.